Tom is originally from Struthers, Ohio and spent his college years at Youngstown State University where he graduated with a Bachelor’s Degree in Business Administration. Tom moved to Breckenridge, Colorado, where he has resided since 1975. Besides being knowledgeable about the Town of Breckenridge and Summit County, Tom has acquired considerable experience in real estate. He began his career in 1980 as a Colorado State Licensed Real Estate Agent. Tom is an avid water and snow skier, and a snowmobiler. He is a past President of the High Lakes Water Ski Club. When there is no snow, Tom’s passion for boating keeps him occupied on the lakes of Colorado and Lake Powell. 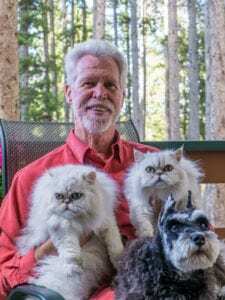 Tom and his significant other, Kathy, enjoy the company of their pets – a Schnauzer named Madison and two Silver Persian’s named Bailey and Simon – when they are not pursuing their outdoor activities. There is no place on earth Tom would rather be than living in the mountains of Colorado. Breckenridge is truly home. Tom looks forward to answering your real estate questions and assisting you in finding the right property to meet your needs. His personal business goal is to exceed the expectations of his clients by providing the highest level of professionalism.